The species is distributed south-eastern Europe, Turkey, Armenia, and Azerbaijan. Armenia is inhabited by endemic subspecies P.a. yeranyani (Dantchenko & Lukhtanov, 2004). In Armenia the species occurs in Central and Southern regions of the country inhabiting calcareous grasslands and the elevation range between 1,200 and 2,200 m a.s.l. The host plant of the species is Astragalus cancellatus. The species gives one generation per year, the butterflies are on wings from mid July till early August. The Anomalous Blue is slightly uncommon within typical habitat. The species belongs to so-called "brown" Anomalous Blues, which have number of very similar species, and therefore create difficulties in field identification. That is why it was impossible to collect the data on the species during regular transects, while the other data, which comes from captured specimens is insufficient for computation of its population trend. It can be estimated that the host plant could suffer from overgrazing, but an influence of that on the Anomalous Blue's population remains uncertain. The species is not included in the Global and National Red Lists, however it is assessed for the Red Data Book of Butterflies of Europe as Least Concern. Also, the species is not included in CITES and Bern Conventions. Based on captured specimens the population could be considered stable, however, taking into consideration existence of endemic subspecies in Armenia, this feature has to be clarified before decision making. So the preliminary conclusion of its conservation status as Least Concern should also refer to the necessity of study of the species conservation status. 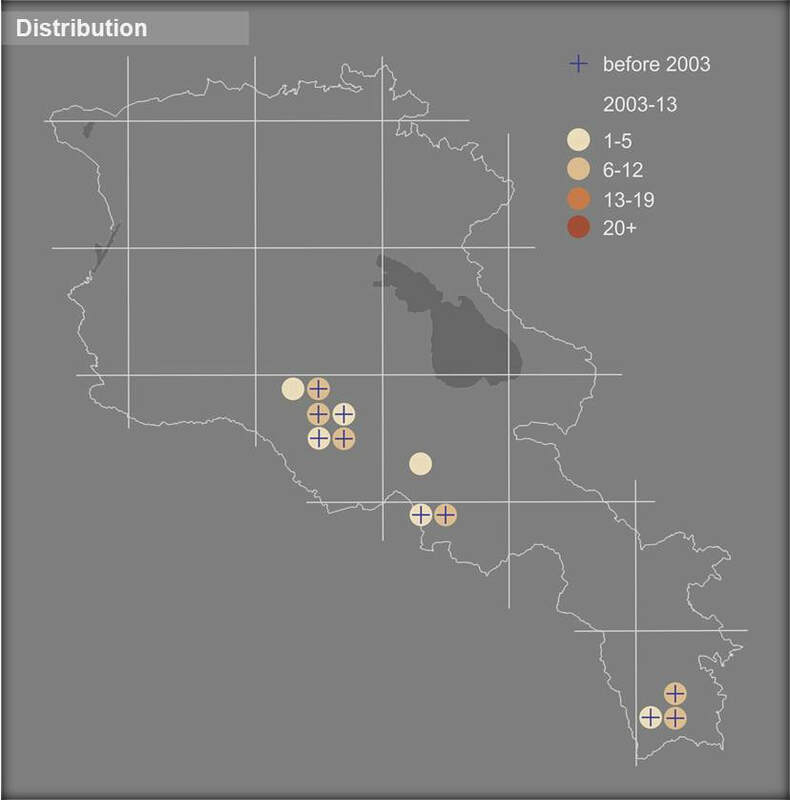 The Anomalous Blue's distribution range is covered by several Protected Areas and Emerald Sites, as well as by Prime Butterfly Areas Gnisheek and Ourtsadzor, and at current there is no needs for special conservation measures, however the investigations of the optimal method of the species monitoring should be determined and introduced.